Real-time consumer data provider Neustar and Dish Media Sales have formed an addressable TV targeting and measurement partnership. 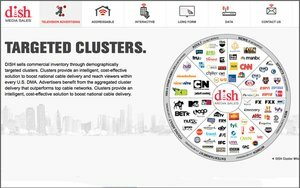 The partnership with Neustar adds to Dish’s consumer profiles, giving marketers more granular options in targeting Dish’s nearly 8 million U.S. addressable TV homes. The companies say it allows brands to reduce “wasted media spending” and to measure the overall effectiveness of marketing activities. With Neustar and Dish, advertisers can build addressable TV audiences based on their own customer relationship management data (CRM), a partner’s or third-party data. Adam Gaynor, vice president of Dish Media Sales, said adding Neustar to its data partners simplifies buying and reporting process for brands. Steven Wolfe Pereira, chief marketing and communications officer of Neustar, stated that with the rise of media and the multi-screen behavior of consumers marketers have the opportunity to transform how they use their customer data. Neustar, which claims some 12,000 clients worldwide, key data platform AdAdvisor Audiences, part of PlatformOne, provides marketers with offline data sources for cross-platform targeting. 3 comments about "Neustar, Dish Media Sales Strike Addressable Deal". Henry Blaufox from Dragon360, July 12, 2016 at 2:40 p.m. Dish audience data, Meister data, the brand advertiser's first party data, probably not associated with the others. Who connects the disparate data stores into a cohesive system for easy use by the brand business users? Henry Blaufox from Dragon360, July 12, 2016 at 2:43 p.m.
Steven Wolfe Pereira from Neustar, July 14, 2016 at 5:19 p.m.
Great question. Neustar helps clients connect their valuable customer data or 1st party data to the digital ecosystem through our omnichannel data onboarding service. Through Neustar’s authoritative identity data platform, clients will be better able to understand their anonymous, unknown and known customers, and then be able to segment and target with unprecedented precision and personalization across all channels. This is unique to Neustar since we are core addressing infrastructure (e.g. Caller ID, DNS, IoT Device Directory, Registry Services, among others) across people, places and things.